One company is only going to charge you $3,000 for materials, but they include about three weeks worth of labor. Another business gives you a bid for $10,000 and they can be done in just two days!? A third company comes in telling you that the whole roof, sheathing, fascia, etc. needs replacing and it’s a $20,000 job! And so on and so forth. Therein lies the importance of two responsibilities from the homeowner – 1) researching a company’s background before asking for a bid and 2) getting as many bids as possible. About 80% of homes in the U.S are covered in asphalt shingles1. Asphalt roofs have the distinction of not only being the most prevalent, but also the material with the shortest lifespan, so it constitutes a majority of the roofing jobs for contractors in your area. People choose to either replace their current asphalt roof with new shingles or replace them with a metal roof, cedar shakes, tile, etc. Some asphalt roofs have supposed life spans of up to 20-30 years, but the truth is they start showing wear in about 10+. If the granules have degraded and the shingles are starting to curl, it’s best for a new roof replacement. 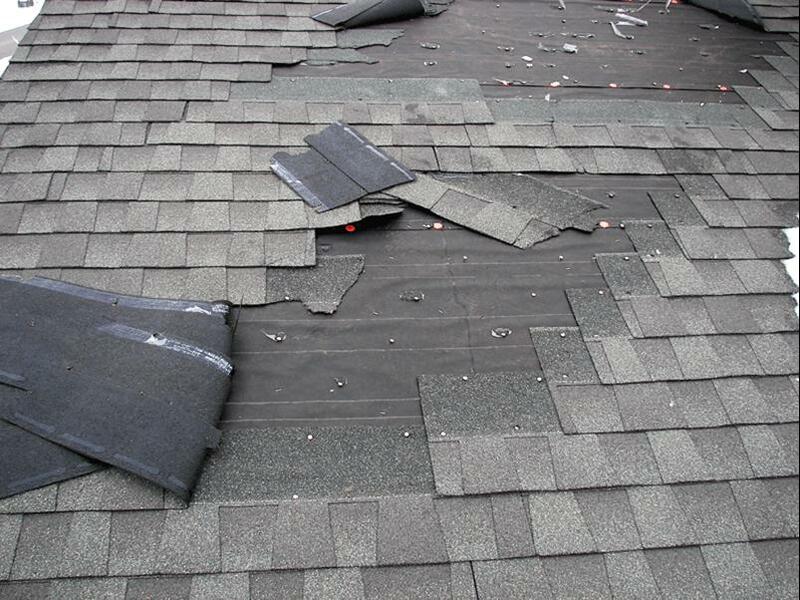 If only a few shingles have blown off because of a wind storm, they can be replaced in minutes. If a new roof is needed, you must decide what to do with the old roof. The obvious choice would be to tear it off and start anew, but that adds a lot of labor to the job. It is possible to shingle over top of the old materials, but you may be putting lipstick on a pig, so to speak, just to save some money. This may be an especially poor course of action, if the plywood sheathing underneath is rotted and failing, thus leading to an early demise of your new roof. Roofing measurements are hard to understand simply because they couldn’t think of a term besides square to define the dimensions. Most people understand a square to be a square foot, the standard measurement for home living area blocked out in 12” X 12” increments. A roofing square however is a 10′ X 10′ block. Therefore your roof’s surface might be 2,200 square feet, but will only need 22 square of roofing materials. Understanding roofing square is important because that’s how contractors charge for materials and labor, even for tearing off the old roof. Contractors might charge up to $200 per square to remove old shingles, depending on whether there are 2-3 layers underneath that were roofed over, and if the roof pitch is very steep. The number of roofing squares represents the first line item to get in your quote – how much per square to tear off? No matter what type of roof you’re sourcing to have put on (asphalt, slate, clay, wood, metal), understand that the surface price is only a fraction of the total cost of materials. — This is because there are many layers and features underneath that help make the roof a properly-ventilated, waterproof, cohesive unit. 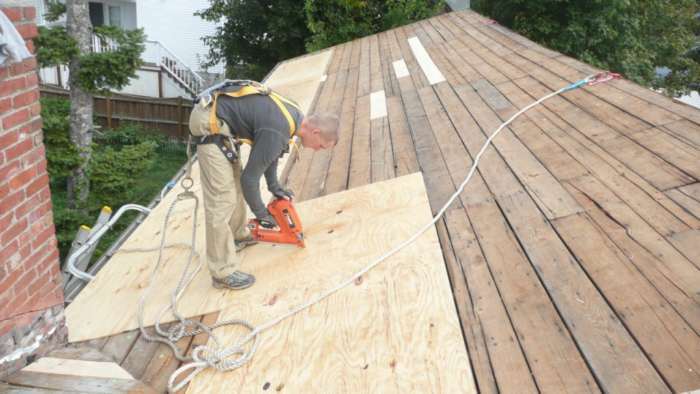 Plywood sheathing – If our old roof had prolonged water exposure there’s a good chance the plywood sheathing that sits on your roof’s trusses has rotted. A 4X8 sheet of plywood covers 32ft2. Divide the square footage of your roof (or the area you need replaced) by 32 to get the number of sheets of replacement plywood needed. If the roof area is 2200ft2 divided by 32 would be 68.75 sheets (15-20% extra for waste is about 78 sheets, each which run about $15-20 per sheet depending on your order size, thickness, delivery, etc.). Roofing Underlayment – A waterproof roof really is a team effort. The top surface material will absorb a brunt of the weather abuse but the roofing felt serves as backup protection in case that top surface receives holes, cracks, and other damage. Underlayment comes in all different size rolls. The traditional #15 black felt will cover about 4 roofing square and costs around $20. It also rips easy, is difficult to walk on, and absorbs heat. Your contractors will thank you for upgrading to a synthetic felt replacement. It is more breathable, easier to work on, and although it can cost $90 per roll it covers 10 roofing square (wider and longer) compared to 4, making the price rather comparable in the grand scheme of things. Winter Guard – As great as the roofing underlayment is you want extra backup where snow and ice build up (valleys, edges of the roof near gutters). This thicker material comes in 2 square rolls but you need less since it only goes in valleys and near the edge of roofs. Certainteed sells Winter Guard for about $50 per roll, while Grace Ice and Water is a little more durable and normally sells for about $80 per roll at Lowe’s. Many homeowners don’t want to skimp in the areas since they are most vulnerable to water, ice, and snow. Drip Edge – Drip edge controls water runoff behind the gutters and into the seams at the edge of the roof. It is a durable sheet metal product that attaches to both the eaves and rake of the roof. 10′ sections of drip edge can cost anywhere between $3.00 and $6.00 which doesn’t sound like much, but does add up depending on the pitch and length of your roof. Nails – Some contractors use cap nails (approx $42 for 2,000) to attach the underlayment instead of stapling for more security. Because of overlap it takes about 80 shingles to cover a square. It’s recommended to nail 4 nails each shingle or 5 in high wind areas so it takes about 320 to 400 nails per square. Items such as roofing vents, skylights, and flashing around chimneys will also add to the material costs, besides the actual roofing surface in squares or total square feet. It only helps, though, knowing what all these materials typically cost and how much of that total amount of materials is generally used, so that you’re not fronting the costs for the company’s next roofing gig. Obviously the major brunt of your roofing bill is going to come from purchasing the surface materials themselves. For many homeowners, it’s this cost which determines what type of roof they will indeed have installed, rather than looks or even durability. One thing to remember is to prorate the costs of the roof for the amount of time you plan on living in this location. You may save on an asphalt roof now, but not over the long term, if you have to install two or three new ones over the next 30-40 years compared to a metal roof. Asphalt – the most popular roofing choice in the U.S. 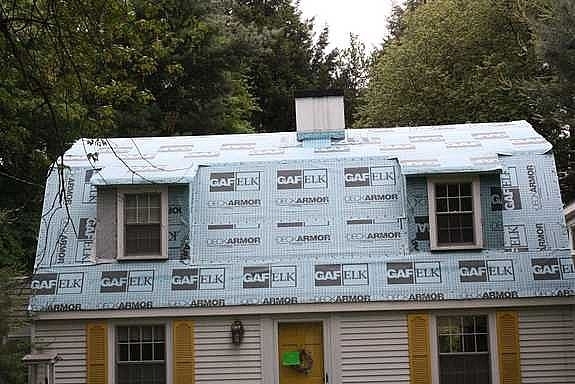 The composite can be made of either a paper fiber mat that is better for cold weather and wind resistance or fiberglass which is more moisture and fire resistant. Asphalt will absorb heat, are prone to blow off in wind if not installed correctly, and are more apt to mold and algae growth. Affordability and ease of installation are huge offsets for many consumers however. Life expectancy2 15-30 years. Cost $100 per square. Metal – steel, aluminum, copper, or zinc alloy to provide either a rustic, “barnsy” look or a more modern style when painted. Available in sheets up to 24′ long that lowers labor time or shingle styles for a more traditional look. Can be recycled and absorbs about 1/3 less heat than asphalt3. 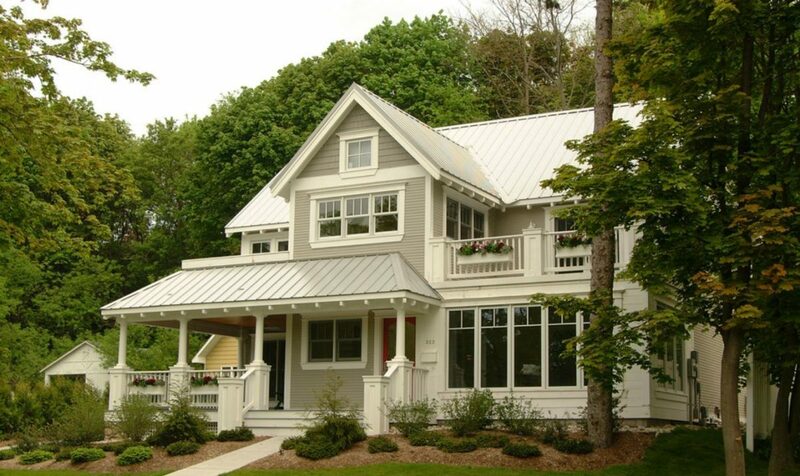 Some metal roofing styles might limit roof access after being installed, and some metal roofs installed over living spaces with no attic can have an echoing sound during heavy rainstorms. Life expectancy 20-50 years. Cost $200 to $600 per square. Wood – typically made of cedar or rot-resistant wood such as redwood. Gives a natural look and weathers nicely, not to mention it being a sustainable, environmentally friendly material. Tile – natural clay or a cement and sand mixture which can be manufactured to emulate many styles such as wood shakes, slate, or traditional Spanish and Italian architecture. Extremely long lasting (although can break) and made of recyclable materials. Large downfall is weight requiring extra reinforcement to trusses for application which drives up labor costs and materials on an already expensive product. Life expectancy 50 years. Cost (concrete & cement) $300 to $500 per square. (Clay) $800 to $1,000 per square. Slate – a ‘lifetime’ roof that is very resistant to wind, fire, and corrosion from the elements. Also a very expensive and heavy material requiring not only skilled workers for installation, but reinforcements to the roof structure to support the weight. Life expectancy 50-100+ years. Cost $1,100-$2,000 per square. It should be noted that these prices may and will vary greatly depending on the season, supply, and other flexible factors. The costs do provide a good comparison tool of what you should expect to pay depending on what type of roof you have installed. Prices will fluctuate somewhat between suppliers, but most contractors in your area should be in the same neighborhood price-wise for material costs. Get multiple bids so you can compare material prices accordingly. One of the most unpredictable numbers to crunch when calculating a roof repair cost is what different contractors are charging for their labor. Some will work on a ‘time & materials’ basis where they give you material costs and you pay them an hourly wage depending on how long the work takes (beware of long lunch breaks and stretched out days in this scenario). A straight up estimate is the material costs and a flat number prediction of labor based on how long the work should take (contractors may be more apt to rush the job or skip over repairs that are needed because it wasn’t foreseen however). How you decide to pay for labor is up to you, most go for the estimate over time & materials because it gives them a static number they can give to a bank or an insurance company. As for costs, that will vary depending on how much a company thinks their time is worth. You will pay more for a contractor who performs quality work and has a stellar reputation. Beware of the ‘storm chasers’ who charge lower labor because they work in volume and are known to sloppily throw together a roof without paying attention to detail. Roofers should give you a labor cost per square, so that you can compare the different rates in your area. Be aware that higher labor rates could also be due to the company being fully bonded and insured and offering guarantees on their workmanship. This often provides sounder peace of mind to justify paying the higher labor rates. Now that you’re aware of what goes into a roofing quote, don’t be afraid to ask for a detailed bid from multiple contractors. It’s hard to compare flat numbers against each other, but if you see how they break down line items such as tearing off the old removal and purchasing materials such as sheathing and underlayment, it does help you see how they came up with the number instead of drawing it randomly out of a hat. The more you know, the better chances you’ll have at paying fair market price for your new roof.